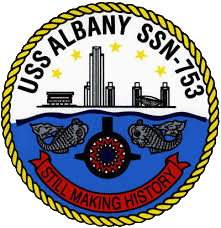 The Albany (SSN 753), an “improved” Los Angeles-class attack submarine, is the fourth ship of the United States Navy to bear the name of New York’s capital city. The contract to build her was awarded to Newport News Shipbuilding and Dry Dock Company in Newport News, Virginia, on November 29, 1983, and her keel was laid down on April 22, 1985. 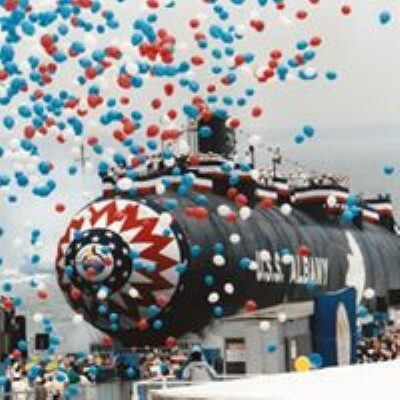 June 13, 1987 The Pre-Commissioning Unit (PCU) Albany was christened and launched during a ceremony at Newport News shipyard. Mrs. Nancy M. Kissinger, wife of Henry Kissinger, served as sponsor of the ship. Cmdr. Daryl R. Anderson is the prospective commanding officer. The Albany was the last U.S. submarine built via the traditional “keel up” ship construction method. Thus, it was the last submarine to “launch” down the shipway. The pressure hull of USS Albany, and also USS Topeka (SSN 754), is partially manufactured using stronger HY-100 steel rather than the HY-80 steel used in the manufacturing of all other Los Angeles-class submarines. This was done to test construction methods using this steel, which would later be employed in the assembly of the new Seawolf-class submarines. From January 10-16, 1990, PCU Albany was underway for Bravo “B” sea trials. Underway for Charlie “C” trials from Feb. 26- March 6; Underway for acceptance trials with INSURV from March 13-14. May 20, The Los Angeles-Improved class attack submarine pulled into Naval Station Roosevelt Roads, Puerto Rico, for a week-long port call. June 2, SSN 753 entered the dry-dock at Newport News Shipbuilding for emergent repairs. Underway for sea trials from June 19-20. June 25, USS Albany departed Naval Station Norfolk, Va., for performance and sound trials and Independent Steaming Exercise (ISE). Port call to Port Canaveral, Fla., from July 20-23; Returned home on Aug. 14; Underway for Operational Reactor Safeguard Examination (ORSE) workup and inspection from Sept. 4-19; Underway for Dependent’s Day Cruise on Sept. 24. September 28, The Albany entered the Newport News Shipbuilding for an eleven-month Post Shakedown Availability (PSA). Underway for sea trials from Aug. 29-30, 1991; Changed from Submarine Squadron (SUBRON) 8 to SUBRON 6 on Aug. 31. September 5, USS Albany pulled into Port Evrglades, Fla., for a week-long port visit to Fort Lauderdale. Underway for sound trials on Sept. 30; Port visit to Cocoa Beach, Fla., from Oct. 9-15; Returned to Norfolk on Oct. 18. November 8, Cmdr. William F. Murphy relieved Cmdr. Daryl R. Anderson as CO of the Albany. Underway for weapons certification from Nov. 12-26. From Feb. 5 through March 6, 1992, USS Albany was underway for ISE, Anti-Submarine Warfare (ASW) exercises and TWC; Underway for ISE and ORSE from April 14- May 8; Port call to Naval Submarine Base New London in Groton, Conn., from June 13-19; Underway for Pre Overseas Movement Certification (POMCERT) and Tactical Readiness Evaluation (TRE) from July 6-9. July 21, USS Albany departed Naval Station Norfolk for its maiden deployment in the U.S. 6th Fleet Area of Responsibility (AoR). North Atlantic Operations from July 30- Aug. 31. August 31, SSN 753 pulled into HMNB Clyde in Faslane, Scotland, for a three-day upkeep. Entered the Mediterranean Sea on Sept. 6; Port call to Naples, Italy, from Sept. 11-16; Upkeep at La Maddalena, Italy, from Sept. 17-22; Participated in exercise Display Determination ’92 from Sept. 26- Oct. 8. November 7, USS Albany pulled again into La Maddalena, Sardinia, for a three-day port call to get tender support services from USS Orion (AS 18). Another visit to Naples from Nov. 11-19; Upkeep at La Maddalena from Nov. 21- Dec. 7. December 10, The nuclear-powered submarine arrived in Gibraltar, British Crown Colony, for a two-day port visit. December 24, USS Albany returned to Norfolk after a five-month deployment. From Feb. 11-22, 1993, the Albany was in dry-dock at Newport News shipyard for emergent repairs. Underway for sea trials from Feb. 26-27. March 13, SSN 753 pulled into Port Evrglades, Fla., for a four-day port visit. Returned home on April 1 after a 27-day underway period in the Atlantic Underwater Test and Evaluation Center (AUTEC) range for support services. May 9, The Albany arrived in Naval Submarine Base Kings Bay, Ga., for a two-day voyage repair. Underway for ISE from June 7-14. July 21, USS Albany entered the Medium Auxiliary Repair Dry Dock USS Shipping port (ARDM 4) at NSB New London in Groton, CT. Returned to Norfolk on Aug. 9; Underway for routine training in the AUTEC from Aug. 14-24; Underway for local operations from Aug. 30- Sept. 9; Underway for sea trials and POM workup from Oct. 18-31 and Nov. 4-9; underway for POMCERT from Nov. 15-19. November 30, USS Albany departed homeport for a scheduled northern Atlantic deployment. December 23, The Los Angeles-Improved class attack submarine arrived in Coulport, Scotland, for a week-long port visit. February 17, 1994, USS Albany arrived in Portsmouth, England, for a four-day port call. March 2, The Albany pulled into Haakonsvern Naval Base for a five-day port visit to Bergen, Norway. Participated in exercise Arctic Express from March 7-18. March 31, USS Albany returned to Naval Station Norfolk after a five-month deployment. May 14, Cmdr. Kevin P. Ryan relieved Cmdr. William F. Murphy as the 3rd CO of SSN 753. May 31, The Albany arrived at Newport News shipyard for a Selected Restricted Availability (SRA). Underway for sea trials from Aug. 13-15; Underway for local operations from Aug. 29- Sept. 2; Underway for routine training in the AUTEC from Nov. 7-23. December 3, USS Albany arrived at Naval Submarine Base New London for a two-week POM training. February 6, 1995, SSN 753 entered the Medium Auxiliary Repair Dry Dock USS Oak Ridge (ARDM 1) at Naval Submarine Base Kings Bay, Ga., for emergent repairs to propulsion train and sonar system. Underway for POM workup from Feb. 19- March 3 and March 23-27; In dry-dock at Newport News shipyard for emergent repair to sonar system from April 4-15; Underway for POMCERT from April 17-21. From April 25 through July 10, USS Albany was deployed to northern Atlantic. Port visits to Rosyth, Scotland, (May 15-18) and Brest, France, (June 20-26). September 30, USS Albany pulled into Port Canaveral, Fla., for a four-day visit. Underway for POM workup from Nov. 13-21 and POMCERT from Dec. 4-8. January 3, 1996 USS Albany departed Naval Station Norfolk for another deployment in the North Atlantic. March 21, The Los Angeles-Improved class fast attack submarine pulled into HMNB Clyde for a five-day port visit to Faslane, Scotland. April 5, USS Albany returned to homeport after a four-month underway period. April 26, Capt. Richard P. Terpstra relieved Capt. Peter S. Flannery as Commander, Submarine Squadron (SUBRON) 6, during a change-of-command ceremony aboard the Albany. From May 27 through June 6, SSN 753 was underway for sea trials and Midshipmen operations in the Virginia Capes Op. Area. Underway again for local operations from July 7-18. From August 8 through Sept. 13, the Albany was underway in the Puerto Rican Op. Area for Battle Group operations. Port call to Roosevelt Roads from Aug. 27- Sept. 1; Underway for local operations from Oct. 28- Nov. 1; Underway again in the Puerto Rican OPAREA from Nov. 12- Dec. 13; Port call to Roosevelt Roads from Nov. 25-30. From January 1-24, 1997, USS Albany was in Medium Auxiliary Floating Dry Dock Resolute (AFDM 10) for emergent repairs. Underway for Comprehensive Training Unit Exercise (COMPTUEX) Phase II from Feb. 7-13. February 21, Cmdr. Brian O’Neill relieved Cmdr. Kevin P. Ryan as commanding officer of the Albany. From March 2-21, the Albany was underway for Joint Task Force Exercise (JTFEX). Underway for Dependent’s cruise on April 23. April 29, USS Albany departed Norfolk for a scheduled deployment, as part of the USS John F. Kennedy (CV 67) BG, in the U.S. 5th and 6th Fleet AoR. May 12, The Los Angeles-Improved class submarine pulled into Gibraltar for a five-day port visit. May 19, The Albany arrived in La Maddalena, Italy, for an eight-day port call to get tender support services from USS Simon Lake (AS 33). Port call to Toulon, France, from June 4-10. June 13, USS Albany anchored off the coast of Palma de Mallorca, Spain, for a four-day port visit. Participated in exercise SHAREM 121 from June 21- July 1. July 7, SSN 753 anchored off Corfu, Greece, for a week-long liberty. ET3 Matthew Davis died from heart attack on July 15; Port call to La Maddalena from July 16- Aug. 2. August 8, The Albany pulled into Haifa, Israel, for a week-long port call. Transited Suez Canal on Aug. 17. August 28, USS Albany moored at Mina Salman Pier in Manama, Bahrain, for a nine-day port visit. Returned to Mediteranean on Sept. 25; Port call to Limassol, Cyprus, from Sept. 27-30; Upkeep at La Maddalena from Oct. 6-11. October 28, USS Albany returned to Naval Station Norfolk after a six-month deployment. December 2, SSN 753 entered the floating dry-dock USS Resolute for a three-month Selected Restricted Availability (SRA). February 27, 1998 The Albany departed homeport for sea trials in the VACAPES Op. Area and sound trials in the AUTEC range. Port call to Port Canaveral, Fla., from March 4-6; Returned home on March 13; Underway again for routine training in AUTEC from March 20- April 2; Underway for Prospective Commanding Officer (PCO) operations at the Atlantic Fleet Weapons Training Facility (AFWTF) range off Puerto Rico on April 27; Port call to Roosevelt Roads from May 9-11; Returned home on May 22; Underway for local operations from June 22-26, June 29- July 2, July 7-9, July 13-17 and 20-24th; Underway for sea trials from Aug. 24-29; Underway for local operations from Sept. 1-3. September 4, USS Albany departed Naval Station Norfolk for a Dependent’s Day Cruise. Underway for local operations from Sept. 8-14; Underway for ORSE from Sept. 15-16. September 25, The Los Angeles-Improved class attack submarine arrived at NSB New London, Groton, Conn., for a 16-day POM Training provided by Submarine School; Underway for sea trials from Dec. 16-18. January 11, 1999 The Albany departed homeport for a nine-day Pre-Overseas Movement (POM) workup. Underway for POMCERT from Feb. 1-5. February 12, USS Albany departed Norfolk for a scheduled northern Atlantic deployment. Port calls to Faslane, Scotland, from Feb. 25-26, Feb. 28- March 3 and March 5-6. April 17, The nuclear-powered submarine moored at Oil Quay Jetty in Olavsvern Naval Base for a six-day port visit to Tromso, Norway. May 4, The Albany pulled into Haakonsvern Naval Base for a four-day visit to Bergen, Norway. Port call to Faslane from May 11-15. July 2, USS Albany returned to Norfolk after a nearly five-month underway period. September 10, Cmdr. Paul N. Jaenichen relieved Cmdr. Brian O’Neill as CO of the SSN 753. September 15, USS Albany emergency sortied from Naval Station Norfolk to avoid the Hurricane Floyd. Underway for Tactical Readiness Evaluation (TRE) from Oct. 19- Nov 11; In dry-dock at Norfolk from Nov. 19- Dec. 15. January 10, 2000 The Albany departed homeport for an eight-day underway to conduct Refresher Training (REFTRA). In February, the sub was in floating dry-dock Resolute to repair a seawater system valve. From March 9 through April 11, USS Albany was underway for a Composite Training Unit Exercise (COMPTUEX) as part of the George Washington (CVN 73) Battle Group. Port call to Port Canaveral from March 16-21; Underway for JTFEX 00-2 from May 9-22. June 26, USS Albany departed Norfolk for a scheduled deployment in the U.S. 6th Fleet Area of Responsibility. Port calls to Gibraltar (July 6-10); Toulon, France, (July 21-27); La Spezia, Italy, (July 29- Aug. 1); Souda Bay, Greece, (Aug. 24-28); Naples, Italy, (Oct. 30- Nov. 3); and La Maddalena, Italy, (July 13-18, Aug. 4-16 and Nov. 22- Dec. 4); Participated in exercise Slunj 2000 in the Adriatic Sea, in early November; Returned home on Dec. 21. January 22, 2001 The Albany arrived at Yorktown Weapons Station, Va., for ammo offload. Underway for REFTRA from March 27- April 5; Underway for Tactical Development Exercise (TDE) and exericse Veritas VII from April 17-26; Underway for PCO operations and TDE from May 2- June 1; Port calls to Naval Station Roosevelt Roads, Puerto Rico, from May 5-9 and Port Canaveral, Fla., from May 27-30; Underway for Midshipmen operations from June 4-8; Port visit to Groton, Conn., from July 21-23. August 8, The Los Angeles-Improved class attack submarine departed homeport in support of USS Theodore Roosevelt (CVN 71) BG’s FLEETEX. In Port Canaveral from Aug. 20-24; Returned home on Aug. 31. September 18, USS Albany entered the dry-dock at Norfolk Naval Shipyard in Portsmouth, Va., for a 14-month Depot Modernization Period (DMP). June 1, 2002, Cmdr. Brett Genoble relieved Cmdr. Paul N. Jaenichen as CO of the SSN 753. July 3, 2002 SSN 753 moved from dry-dock to a pierside location at Norfolk Naval Shipyard. Underway for sea trials from Nov. 18-24; Underway for local operations from Dec. 5-13. From Feb. 3-5, 2003, the Albany was underway for local operations. Underway again from Feb. 11-14, Feb. 18-20, Feb. 22- March 6 and March 12-31; Underway for PCO operations from April 29- May 27; Port calls to Groton, Conn., (May 1-2) and Port Canaveral (May 16-19); Underway for Midshipmen operations and ORSE from June 24- July 11; Underway for REFTRA from Sept. 2; Another visit to NSB New London from Sept 14-26. October 10, USS Albany entered the Medium Auxiliary Floating Dry Dock Resolute for a three-week upkeep. Inport NWS Yorktown from Nov. 8-14; Returned home on Nov. 24; Underway for routine training from Nov. 29- Dec. 9; Inport Port Canaveral from Dec. 5-6; Underway for local operations from Dec. 15-18; Underway for TRE and POMCERT from Jan. 6-23. January 30, 2004 USS Albany departed Norfolk for a scheduled deployment in the U.S. 5th and 6th Fleet AoR. Upkeep at La Maddalena, Italy, from Feb. 12-16. March 5, The Albany pulled into Souda Bay, Crete, for a six-day port call after participating in exercise Dogfish from Feb. 17- March 5. March 21, The Los Angeles-Improved class attack submarine arrived in Muscat, Oman, for a brief port call before participating in exercise Arabian Shark; Port call to Jebel Ali, U.A.E., from April 11-16. May 18, USS Albany arrived in Manama, Bahrain, for an eight-day upkeep. June 21, The Albany arrived at Naval Support Activity La Maddalena for a week-long port call to get tender support services from USS Emory S. Land (AS 39). July 1, SSN 753 pulled into Gibraltar, British overseas territory, for a four-day port visit before participating in exercises Shark Hunt and Majestic Eagle. July 30, USS Albany returned to Naval Station Norfolk after a six-month deployment. From September 8-10, the Albany was underway for Basic Submarine Assessment (BSA). Underway for Submarine Command Course (SCC) preparations from Oct. 17- Nov. 24; In port Groton, Conn., from Oct. 21-29. April 1, 2005 Cmdr. Mark H. Merrick relieved Cmdr. Brett J. Genoble as commanding officer of the Albany. November 20, 2006 USS Albany returned to homeport after a six-month deployment to the Atlantic Ocean and Caribbean Sea. The ship participated in missions in the Gulf of Guinea and directly supported counter-narco terrorism operations in the Caribbean, resulting in the confiscation of more than 2.8 tons of narcotics. June 14, 2007 Cmdr. Thad E. Nisbett relieved Cmdr. Mark H. Merrick as CO of USS Albany during a change-of-command ceremony at Naval Station Norfolk’s Pier 3. September 29, SSN 753 is currently in the Atlantic Ocean conducting Expeditionary Strike Group Integration exercise (ESGINT), with the USS Nassau ESG, in preparation for the upcoming deployment next year. April 25, 2008 USS Albany departed Naval Station Norfolk for a scheduled deployment. 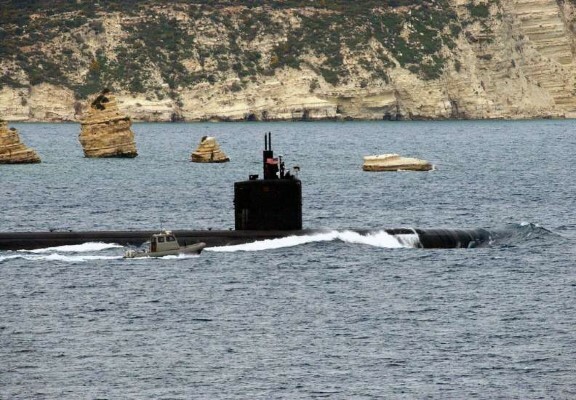 May 10, The Los Angeles-Improved class attack submarine arrived in Souda Bay, Crete, for a routine port call. June 11, The Albany pulled into Souda Bay for another port visit. November 18, USS Albany returned to homeport after a seven-month underway period in support of Maritime Security Operations (MSO). The sub also visited Augusta Bay, Italy; Marseillles, France; Haakonsvern, Norway; Jebel Ali, U.A.E. and Manama, Bahrain. June 9, 2009 SSN 753 is currently undergoing a maintenance availability at Naval Station Norfolk to upgrade equipment and conduct necessary repairs. October 15, Cmdr. Thomas R. Buchanan, Jr., relieved Cmdr. Thad E. Nisbett as CO of the Albany during a change-of-command ceremony. February 12, 2010 USS Albany departed Norfolk for a six-month deployment, one day later than scheduled due to bad weather. February 22, The Albany recently pulled into Naval Station Rota, Spain, for a routine port call. August 11, USS Albany returned to homeport after traveled 34,500 n.m., conducting national security and maritime security operations in the U.S. 6th Fleet Area of Responsibility. Port calls included Faslane, Scotland; Haakonsvern, Norway; and Lisbon, Portugal. March 16, 2011 Northrop Grumman has been awarded a contract valued at $25 million for the preparation and completion of a dry-dock continuous maintenance of the Albany, that arrived at Newport News shipyard Tuesday morning. Work is expected to be completed by the end of July. December 14, 2011 Cmdr. David S. Soldow relieved Cmdr. Thomas R. Buchanan, Jr., as CO of the USS Albany during a change-of-command ceremony on board the sub at Norfolk. June 7, 2012, USS Albany departed Naval Station Norfolk for a scheduled deployment. October 24, The Albany departed HM Naval Base Clyde in Faslane, Scotland, after a routine port call. March 8, 2013, USS Albany returned to Norfolk after an extended eight-month deployment in the U.S. 6th Fleet AoR. The sub traveled more than 40,000 n.m. and also visited Lisbon, Portugal; Hakonsvern, Norway; and Rota, Spain. October 16, SSN 753 entered the Norfolk Naval Shipyard in Portsmouth, Va., for a 29-month Engineered Overhaul (EOH). February 20, 2014 Cmdr. Robert W. Landis relieved Cmdr. David S. Soldow as the 11th CO of Albany during a change-of-command ceremony at Naval Station Norfolk. August 26, 2016 Cmdr. Roy L. Wilson, Jr., relieved Cmdr. Robert W. Landis as CO of the USS Albany during a change-of-command ceremony at the Vista Point Conference Center on Naval Station Norfolk. April 25, 2017 USS Albany undocked from Dry Dock #2 and moored at Berth 3, Pier 3 in Naval Station Norfolk.